Handstand is considered to be the most effective yoga poses of all, and it is very beneficial to those who practise daily. Yogis who do it incorrectly, or even slightly poses inaccurately can cause immediate or gradual damage to the neck and spine. The number of yoga enthusiasts is increasing, which is a great sign; however, doing the posture correctly is significant to enjoy health benefits. 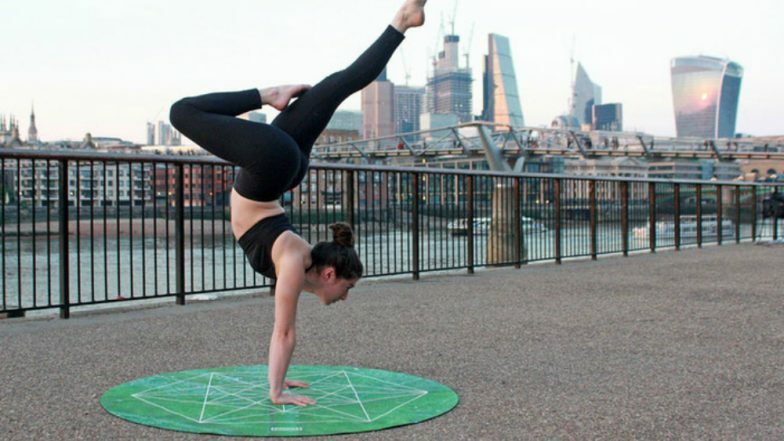 Recently, a yoga fanatic from Maryland, United States has revealed how she suffered a severe stroke by practising a complex handstand. She tore her neck artery and is still suffering from memory loss and headaches but has not given up the passion for the meditative practice. Does Yoga Make You A Self-Centred Egoistic Narcissist? Yes Says Study. In October 2017, Rebecca Leigh, had been filming a tutorial for her social media fans just hours before the injury. While attempting a “hollowback handstand” pose, she experienced blurry vision and lost control of her arm in the immediate aftermath. “It only lasted five minutes, but then my head began to hurt,” Leigh was quoted saying to SWNS, explaining that she initially thought she had aggravated a herniated disc having had a similar symptom when she had done so in her twenties. “I suffered from headaches and migraines since I was a teenager but I knew this was different,” she added. 10 Health Benefits of Yoga That Are Too Good To Be True. In the following days, Leigh noticed her eye was dropping, and her pupils were different sizes. She was rushed to the hospital by her husband. “The doctor on staff came into the little room we were waiting in and said in a monotone voice: ‘Well, you my dear, had a stroke,” Leigh was quoted in the same report. “Kevin and I both let out a little laugh, because we thought he had to be kidding. There was no way that someone my age, in my health, could have had a stroke. But he responded to our laughter in a solemn silence and his face said it all,” she added. A CT angiography scan revealed that Leigh tore her right carotid artery in her neck while performing the handstand. Little Chinese Boy Darting Into Yoga Class Late And Transforming into a Pose Leaves Social Media Laughing. A carotid tear is the result of a neck injury such as a car accident, or extreme neck rotation or extension. According to Cedars-Sinai Medical Center, a tear typically causes headache, eye pain, scalp pain, neck pain, a droopy eyelid, weakness or numbness on one side of the body and several other issues. Leigh had spent the next several weeks in constant pain and avoided light. She said she could not get out of bed or even eat properly, without assistance. The 40-year-old gradually regained strength and made her way back to the yoga mat. After the terrifying experience, she now focuses on postures she feels safe in and simple stretches.